"Don't worry, Abu. He's a genie, and genies can't kill anyone... although you'd be surprised what you can live through." Aladdin: The Return of Jafar has a lot of explaining to do. The 1994 direct-to-video movie, produced to promote the premiere of (and strung together from three episodes of) the Aladdin animated series, was the first of Disney's trumped up "sequels" to cash in on the success of a popular theatrical feature. It proved to be very, very popular, despite the fact that it isn't very good (I didn't even like it when I was 12, and a huge Aladdin fan), and the House of Mouse has since followed suit with follow-ups to everything from Tarzan to Dumbo, and even Cinderella (no cow is too sacred for the little mouse). As a result, Disney's animated films, once a major event, became just another commodity in a media-saturated market, and the public lost interest. Today, traditional animation is no more at Disney, as audiences are entranced by the shiny graphics (and, more importantly, strong storytelling) of films from Pixar and PDI. But maybe I'm being too hard on poor The Return of Jafar. After all, Aladdin was a monster hit, and many people (me included) wanted to see the story continue. And though the way it was done is fairly routine, the program has its moments. The story picks up very soon after the end of the first film. Genie is free and Jasmine and Aladdin are in love. But pesky villain (spoiler!) Jafar, who we last saw transformed into a genie himself and trapped inside a lamp with his sidekick, the parrot Iago, isn't as gone as our heroes presumed. A new villain with a grudge against Aladdin, Abis Mal (voiced by Jason Alexander) finds the lamp and sets Jafar free. The despot goes about tricking Abis Mal into using his wishes to hurt Aladdin, while Iago faces a crisis of conscience—does he really want to remain a bad bird? The script is pretty much by the numbers, as are four new songs that ape the Oscar-winning music of the original. Happily, though, most of the original voice talent is back, including Scott Weinger as Aladdin, Linda Larkin as Jasmine, and Gilbert Gottfried (well, maybe not so happily... just kidding, all you members of the Gilbert Nation). That list does not include Robin Williams as Genie (he refused to return due to a dispute with Disney over the way the first film was marketed). Filling in is Dan Castellaneta, better known as Homer Simpson, and he does a decent job impersonating Williams' manic energy, though at times the Genie sounds like he's going to bust out a "D'oh!" The production values are rather unfortunate, though. Three different animator workshops in Asia reportedly worked on the feature, and the style of character animation shifts noticeably throughout, with some early portions looking very cheap and cartoony, and later moments coming a bit closer to matching the first film. Backgrounds also appear very basic throughout, with none of the intricate charm of the 1992 version. 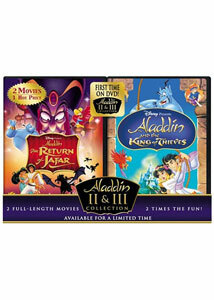 I'd say die-hard Aladdin fans might as well pick this up (it's being released in a two-pack with its sequel, Aladdin and the King of Thieves), but really, do we need to encourage Disney to make any more of these things? I don't know whether it's the production values or the age of the material, but Return of Jafar is no prize on DVD. The images looks washed out and muddy, with dull colors and soft contrast. The audio isn't much better; the 5.1 mix may as well be 2.0, with no involvement from the surrounds and a noisy, unbalanced mix that cranks up the sound effects and music and leaves dialogue in the lurch. Extras Review: I've got to give Disney credit for putting their shoddy product in a nice, shiny box: Return of Jafar makes nice on DVD with fancy menus featuring new dialogue from the original vocal cast and nifty interactive animation. Too bad the extra content, which amount to a song selection menu and two interactive games, is nothing to get excited about (though the Wish at Your Own Risk game, a take on the story of the monkey's paw, will be fun for kids). The disc starts of with trailers for the upcoming Bambi special edition, The Incredibles, and Mulan II (which is sure to be good, seeing as Aladdin II was so... oh). It's hard to believe that such a bland, innocuous little movie is actually the first sign of the 10-year decline of Disney animation. The first of the company's cash-in sequels, and like all the others that followed it, it made money for the studio while serving only to slowly chip away at the audience's faith in the Disney name. In 2004, Disney produced its last traditionally animated feature, the poorly received Home on the Range, and from now on, the great animation studios will be put to work churning out yet more direct-to-video trash. If only we'd had a genie around ten years ago to warn us.